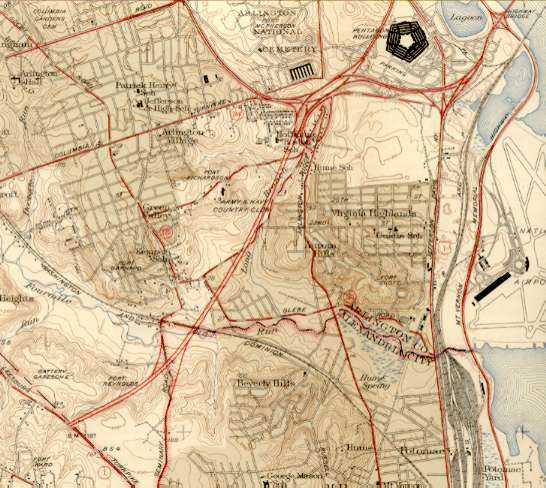 Shirley Highway only extended as far as Route 7 according to this 1945 Topo map. Shirlington did not yet exist and Quaker Lane was known as Seminary Road. Route 1 provided the main connection to Richmond and Shirley Highway was not used for that purpose. Shirley Highway was eventually extended as far as the Occoquan River where it fed into Route 1. Notice the grade crossing of the Washington and Old Dominion Railroad. Trains used to cross the expressway at about 3 miles per hour. Their were a number of collisions between cars and trains despite the slow speed of the trains. After the Interstate Highway System was started the entire length of Shirley Highway became known as Interstate 95. When it was decided that I95 would not pass through Washington the portion north of the Beltway became known as I395 and the Beltway east of Springfield dropped the I495 designation and became only I95. Later this was changed again so that the Beltway became designated as I495 for its entire length as well as I95 east of Springfield. The grade crossing with the railroad was retained after Shirley Highway became part of the Interstate Highway System with the idea that the railroad would be abandoned. This did not take place until 1968.